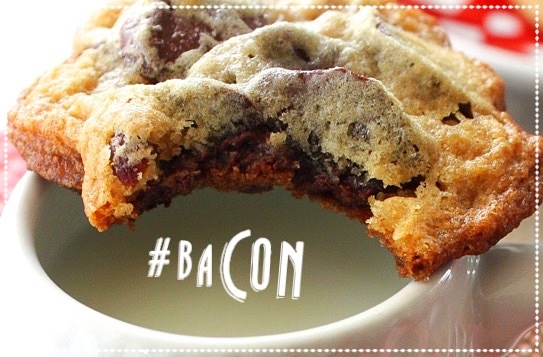 On my cookie quest a few years back I came across this yummy cookie, what makes it so great is bacon 🥓 yes, I said bacon! It has a sweet, smoky, salty taste that rocks your taste buds. This makes a great twist on a truly classic cookie. One that I know your friends and family will enjoy. Get ready for an explosion of yummy goodness. In a separate bowl, combine flour, soda and salt and set aside. In a bowl mix together butter and both sugars. Add egg and vanilla and mix until creamy. Stir in flour mixture and mix well. Stir in chocolate chips and bacon. Drop rounded cookie dough onto your baking sheet. Sprinkle with sea salt on top of each cookie dough ball. Bake for 8-10 minutes or until lightly golden. Let cool and enjoy.